Disc 2 recorded live at Konk Studios, London, UK, 2013. Die ersten zwei Titel machen Appetit, aber dann klingt alles doch wie immer. 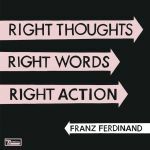 Nix Besonderes, der Sound ist weiterhin ok.
An extremely good album from Franz. Not the best album but it's certainly still a good album. I'll give it a 4.5 because wonderful bass and vocals from Alex. Well done Franz! Quite a strong album, though I didn't think so at first. With repeated listens I began to enjoy it more and more and found the tracks quite enjoyable, particularly Fresh Strawberries, Bullet and Right Action. It's not their best work, but it's not an embarrassment by any means.